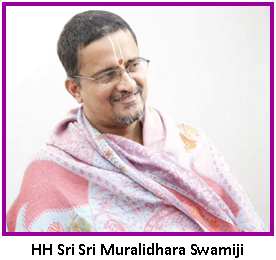 Categories: Bhakti, Spirituality, Sri Muralidhara Swamiji. Sri Swamiji’s satsang was held in Tiruchirapalli Namadwaar on 16th February 2018. More than 300 devotees participated in this. The satsang began with Gopakuteeram children rendering Srimad Bhagavata slokas followed by Madhura Gitams. Sri Swamiji then expounded on the sweetness of and the simplicity in the Divine Name of the Lord and discoursed on the liberation of Sabari. Prasad was distributed to all present. As it was Friday, after the Satsang, Sri Swamiji visited the temple and had darshan of Sri Ranganatha and His Consort. 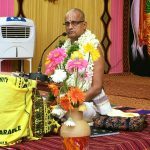 The following day 17th February Sri Swamiji conducted satsang in Andal Kalyana Mantap in Thanjavur. Sri Swamiji brought joy to all present, by narrating the life history of Namdev which is a testimony to the Lord being drawn to and appearing in the place where Namakirtan is performed. Sri Swamiji then went to Thanjavur Navaneetha Krishna’s temple, had darshan of the Lord and rendered Navaneetha Krishna kirtans for a while. He then visited the place which has been newly acquired for Thanjavur Namadwaar. As it is an old building Sri Swamiji instructed it to be pulled down. Sri Swamiji spent the night in Sri Rajagopalan’s home. The next morning Sri Swamiji woke up early at four and left for Sri Rangam to enjoy Theppathiruvizha (festival of the Lord moving in the pond). That morning Lord Ranganatha went in palanquin beautifully decked in white silk, pandiya pendant, hair made up in pandya bun, Kasu mala, waistband, Chandrakatta mala. From there Lord Ranganatha was carried to Rangavilas mantap where He was seated in a parrot cage! Until evening the Lord sat in that parrot cage! The Lord then moved on a silver vehicle of Swan (hamsa vahanam). In the festival (Utsav) during the Tamizh month of Thai (mid-January to mid-February) and again in the Tamizh month of Maasi (mid-February to mid-March) the Lord moved in procession on the street where our Vedic school is. Every evening Sri Swamiji used to stand at the gates of our Vedic school and enjoy the Lord even as he performed Mahamantra kirtan along with the devotees. The following evenings the Lord moved on various other silver vehicles viz. Hanuman, Kalpaka Vruksham (wish fulfilling heavenly tree), Garuda. On the evening that the Lord moved on Garuda vehicle, He was welcomed at the gates of our Vedic school with a big pandal decorated with electric bulbs, plantain trees and a festoon of mango leaves. Hundreds of devotees worshipped the Lord even as they performed Namakirtan. Sri Swamiji shed tears with the thought ‘the Lord rushed on Garuda vahana in response to the call of Gajendra! Is there any other God who would rush to the call (of the devotee)’. That morning Sri Swamiji took the students of our Vedic school to the butterfly park run by the forest department. On the 22nd Sri Swamiji had darshan of the Lord in the palanquin and then went to Ganapathi Agraharam. After the darshan of Lord Ganesha there Sri Swamiji went to the holy place Aduthurai and had darshan of Sri Jagatrakshaka Perumal. He sat in front of the Perumal and rendered kirtans for some hours. Wild bushes and thorny plants filled the temple and Peepul tree had penetrated the compound walls of the temple. Sri Swamiji shed tears even as he prayed to Perumal ‘All the Divya desams should see good times. Lots of priests (Archakaas) should come forward to serve You and conduct puja, festivals, as prescribed. O, Lord! You have to find a way for this. Please have the consecration ceremony (samprokshanam) performed soon’. That day Sri Swamiji with tears prayed that claiming himself to be Vishnu Bhakta it hurts him to see these temples in a dilapidated state and that he could not remain quiet and indifferent; that the Lord Himself should set it right. “If this state is going to continue please take me unto yourself. I am unable to bear this state of your temples. 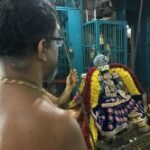 I feel deeply concerned about the state of the temples in future while it is so bad even now,” Sri Swamiji lamented to Perumal. Sri Swamiji then visited the Divya desam Kapisthalam and after the darshan of Lord Attrankarai Kanna along with His, Consort Ramamani reached Govindapuram. As it was Thursday Sri Swamiji went to Sri Bhagavannama Bodendra Swami’s Brindavan and had darshan. The dilapidated state of Aduthurai Perumal temple left Sri Swamiji sleepless that night. The whole night he did not sleep a wink. Next morning as soon as he woke up Sri Swamiji went to Aduthurai taking Venkatesan ji with him. The Lord was offered oil, sandal paste, new clothes, flower garlands, etc. With the help of a Bhakta Rajesh who was there the compound wall was cleared of tree growths to a great extent. 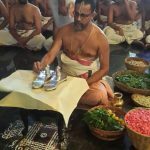 Sri Swamiji has also arranged for ‘uzhavaarappaNi’ (clearing the temple of unwanted wild growth of trees, plants, and grass) to be taken up by this month end. He desires incessant chant of the Mahamantra there. As it was past one in the afternoon when Sri Swamiji reached Kapisthalam the temple doors were closed. The next morning oil, clothes, flowers were offered to Kapisthala temple through our Tirunangoor Agama school student who is the priest of Sri Aravamudan temple. On the 24th morning Rohini procession, as usual, was done at Senganur. As it was Saturday more than 300 devotees participated in it. In the evening Sri Swamiji reached Mathurapuri Ashram.